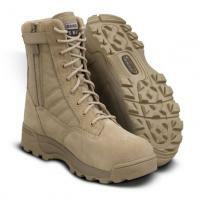 Original SWAT 1194 Men's Classic 9" Tan Safety Toe Side Zip Boots FREE SHIPPING! The Original SWAT 1194 Men's Classic 9" Tan Safety Toe Side Zip Boots are built to combine high levels of protection with superior comfort. The rugged, wear-resistant 1000 denier nylon and leather upper conceals a composite safety toe that can withstand severe impacts, protecting your feet from injury. It is coated with Scotchgard for enhanced water and stain resistance. The YKK side zip makes it easy to take these boots off and put them on quickly, and comes with a Velcro tab for protection. The boot's shape and compression-molded insole are based on athletic footwear, and provide comfortable cushioning and support for reduced fatigue and increased mobility. The non-metallic shank provides great stability, and unlike steel it won't set off metal detectors. Underneath, an aggressive tread pattern provides reliable traction in all terrains. ©2002-2019 CopsPlus.com: Original SWAT 1194 Men's Classic 9" Tan Safety Toe Side Zip Boots FREE SHIPPING!